In the developing world, basic healthcare is often a challenge—let alone expensive medical screening or tests for easily treatable, preventable illnesses. TEDGlobal, an annual conference devoted to "ideas worth spreading" taking place in Tanzania this week, heard of new technologies that could revolutionise healthcare for the poor. Infectious diseases are fast being overtaken by afflictions such as cancer as the biggest health problem in Africa, where some countries have only one pathologist per one million people. Sierra Leonean roboticist David Sengeh believes training more specialists is not enough, and is working with his team at IBM Africa on artificial intelligence (AI) algorithms that can predict a cancer's progression. AI software can be trained with a database of images to detect colour changes inside the cervix that point to patients at high risk for cervical cancer, which can be treated if caught in time, but which kills 60,000 women in Africa a year. Addressing a similar problem, Pratik Shah of the Massachusetts Institute of Technology (MIT) has developed a system to use simple cellphone or camera pictures—instead of expensive MRI or CT scans—to identify biomarkers that point to oral cancer. He told AFP that while AI systems typically need tens of thousands of data points to function, he has found a way to use only 50 images to train algorithms to identify a specific disease. "We believe our approach could be used to massively reduce the amount of data an AI algorithm currently consumes, and empower physicians to diagnose patients using simple images," he said. Both Shah and Sengeh are new members of the TED Fellows Programme which aims to spread the ideas of young innovators. More than 1.1 billion people worldwide live with hearing loss—half of which is preventable, according to the World Health Organization. American ear surgeon Susan Emmett said most of these are in low and middle-income countries where traditional hearing tests are a challenge. 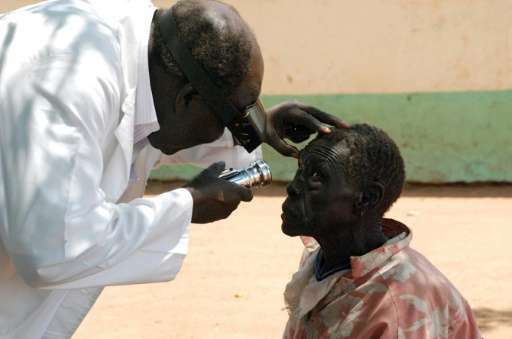 Malawi, for example, has only two ear surgeons and 11 audiologists. Emmett is currently testing South African-developed mobile screening technology in rural Alaskan communities that has replaced the need for an audiologist, permanent equipment and a soundproof room. The technology, costing 10 times less than traditional solutions, involves noise-isolating headphones and an adaptor attached to a mobile phone used to examine a patient's ears. Another speaker, Kyle DeCarlo, who is deaf, wishes the world would be more concerned with giving the deaf access to language rather than sound. He has developed a semi-transparent surgical mask so that deaf patients can read the lips of their doctors in hospitals. The audience was also shown a video by eye surgeon Andrew Bastawrous who won a Rolex Award in 2016 for Peek, an "eye-phone", or smartphone app he developed for use in Kenya, which uses a low-cost clip-on device to take images of the back of the eye to test sight. In Rwanda, a system launched last year to fly blood via drones from a central distribution centre to hospitals around the hilly nation has saved numerous lives, said robotics entrepreneur Keller Rinaudo, whose company Zipline runs the system. The drones, which drop boxed packs of blood slowly to the earth via a paper parachute, now deliver 20 percent of blood supply outside the capital Kigali. In one case a 24-year old woman bleeding out after childbirth was saved after several emergency flights in a row delivered more blood than is contained in one human body—which was all transfused into her. Last week, Tanzania's health ministry announced they would use the same technology to deliver a variety of medical products from four distribution centres via drone in what is set to be the largest autonomous delivery system anywhere in the world.